If Jahlil Okafor saw his draft stock slide a bit during the tournament, then Justise Winslow saw his stock head in the opposite direction. Perhaps no one in college basketball improved his future earning potential than the Duke forward. 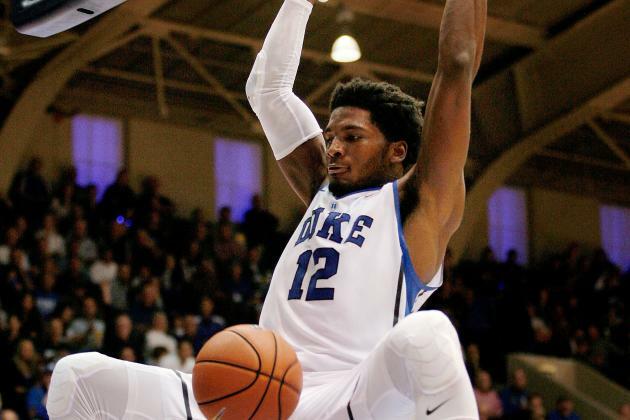 Winslow’s shift from the 3 to the 4 in Coach K’s starting lineup signaled the beginning of a torrid stretch of play after his struggles during January and early February. At 6’6” and a solid build, Winslow was able to handle guarding power forwards on defense and blowing by them on offense or in transition. He might be just a touch too small to truly play power forward in the NBA (though he is only slightly smaller than Draymond Green). But with an improving jump shot, excellent athleticism, and good rebounding instincts, he can play the 4 in stretches in small lineups without sacrificing too much on defense. In an NBA where Spurs-like flow offenses become more prevalent (see Atlanta, Boston, and Dallas), the ability to have hyper-versatile defenders switching picks without allowing a mismatch becomes more and more important. This is something that Justise has not only the potential to contribute, but is something he has already proven at the highest level of collegiate competition. Plus, he has already mastered the Lebron/John Wall chase-down block in transition. On offense, Winslow is still developing, but he has shown flashes of the high-level offensive potential he clearly possesses. A monster on the fast break, Winslow had great success rebounding on the defensive end and pushing the ball all the way to the goal. With his feet set he is more than an adequate three point shooter, especially from the left wing (though his mid-range game was terrible). He should be able to extend that range and consistency with NBA coaching. Finally, he as the clip above showed, he has remarkable footwork around the rim. More than any college player I remember seeing, he has mastered a Euro-step that has led to layups and fouls both in the half court and in transition. As Mark Titus has written, Winslow may be the avatar of what modern NBA general managers (read: not Ernie Grunfeld) look for in a prospect. Winslow plays lockdown defense on every position from 1 to 4. He shoots threes well(ish) and is great at creating offense at the rim, including drawing fouls. The most common comparisons for Winslow start with Michael Kidd-Gilchrist and Jimmy Butler. I think, with the right team, he could eclipse both in total all-around play (though Butler has been fantastic this year). Winslow will probably never be the dominant scorer on a championship level team, but he is the kind of player that makes good teams great. If things go well, he could be Jimmy Butler or Draymond Green, guys who will command max or close to max contracts. Even for a top 3 or 5 pick, that would be a successful career. I’ll leave you with some visual food for thought. I’ll be back soon with more on Tyus Jones.